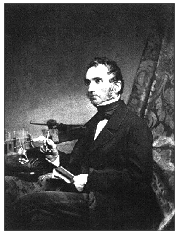 Justus von Liebig (1803-1873) posing with his apparatus for combustion analysis. 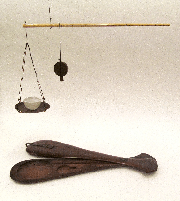 Issue 40 outlines the history and importance of the chemical technique known as combustion analysis and highlights a reproduction of Liebig’s famous 1831 instrument for this purpose made by the late Dr. Melvyn Usselman of the University of Western Ontario and donated to our museum collections in 2005. Issue 38 describes a recently acquired bust of the Greek philosopher Epicurus and his importance to the history of atomism.